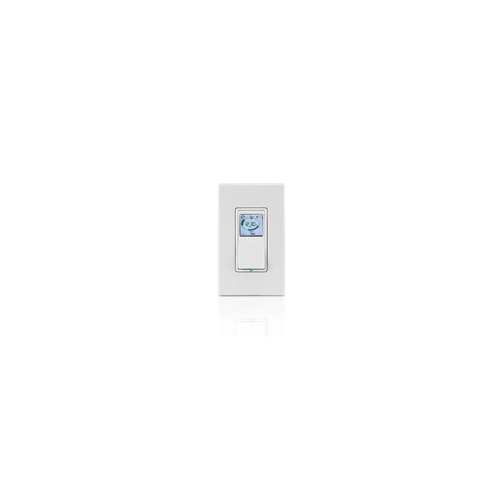 Leviton's Vizia+ 24 hour timer switch provides manual control as well as scheduled on/off times for incandescent, LED, CFL or even small motor loads. With a built in astronomic clock that calculates approximate sunrise and sunset times, you will be able to set schedules based on an exact time or based on sunrise. The VPT24-1PZ may be used as a single pole (single switch) or a 3 way application (2 switches for one load) by adding VP0SR-1LZ. For flexibility, a white faceplate is pre-installed, with colour change kits included for light almond and ivory. Other colour kits may be purchased separately. Two programming modes are available. In standard programming mode, up to 3 on/off events can be set for fixed times 'every day', Mon-Fri and Sat-Sun. In pro mode, up to 50 on/off events can be scheduled based on fixed time or sunrise/sunset or random mode on any day, 'every day', Mon-Fri or Sat-Sun for utmost flexibility. The VPT24-1PZ has a backlit LCD display, green LED locator and battery back-up to save settings and time in case of a power failure. White face installed, ivory and light almond included.